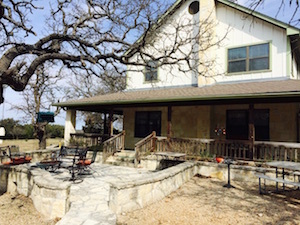 Located 9 miles north of Fredericksburg at 9108 Ranch Road 965 (the Enchanted Rock Highway), turn at the big Longhorn located at the ranch entrance. 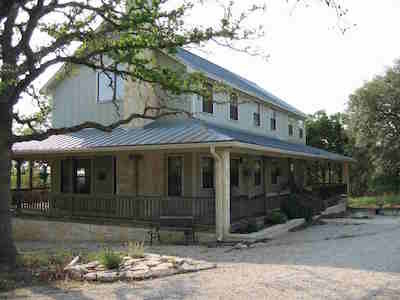 As you enter the ranch there are two Ranch Guesthouses that are available to rent. They are approximately 50 yards from each other. Both have wrap around porches and are fenced and secluded from our longhorns, although the longhorns do stop by hoping for a treat sometimes! We supply range cubes for guests to feed them. 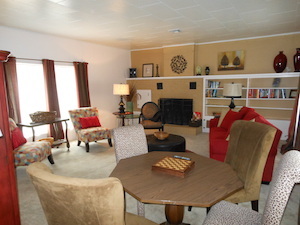 Each house has a fire pit and gas grill and lots of outdoor seating to enjoy the wonderful mornings and evenings. Enchanted Porch sleeps 14 and Grandmother’s Porch sleeps 13. Great for family reunions, bridal parties, wine tours, golf outings, or group and family gatherings. With 64+ acres there are a lot of places to walk and explore including limestone bluffs, seasonal Bee Creek, lots of wild life, spring fed, crystal clear Polander Creek, and of course our longhorns. If interested in reserving a guest ranch house, after clicking the link above to see pictures and details of each house, click on the “Reserve Now” button. -After reviewing the calendar, choose dates for check in and check out. -Input # of adults, children and pets (yes we accepts children and pets). -If dates are available, click the “Reserve” button. -At this point, additional activities can be ordered (wine tours, spa, etc) if desired, if not, click the “Skip Store” button. -Now enter contact & payment info. -If you prefer to make the reservation over the phone, please call our reservation service (Gastehause Schmidt) at 866-427-8374 or 830-997-5612 and tell them you are reserving either Enchanted Porch or Grandmother’s Porch, or both! 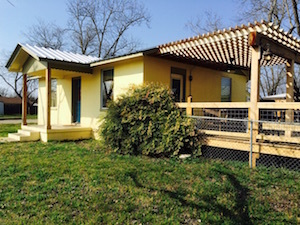 If interested in a guesthouse in Fredericksburg city limits, we also have two city guest houses available. Sam Houston’s Retreat is only 3 blocks from Main Street shopping and two blocks from the popular Rock Box. Aunt Pam’s is our second city guesthouse and is a beautifully decorated cottage in a quiet neighborhood not too far from Main Street. Whether you like to stay in the country or the city, we hope to see you soon!